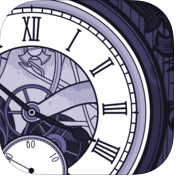 Time Machine: Age of the Emperors is a excellent educational iOS eBook that is free today. This is an innovative digital book that is great for History teachers that is highly interactive for students. The way this works is a user creates a profile/character and then makes decisions as they explore different ancient emperors and civilizations. The choices they make affects their progress throughout the book and best of all it saves their progress as they go along. I highly recommend checking out Time Machine: Age of the Emperors by clicking here!! !